Consider the size, height, width, depth on the outside and how big of a ventilation does it require. The mini freezer is a useful little device that can fit in many places in the house that a good old deep freezer is way too big for. By keeping one of the many small freezers available on the market in your house, near the kitchen, you are far more likely to take advantage of the benefits of having a freezer and far less likely to run into the problems that come with having a giant freezer, such as freezer burn or the freezer taking all the money out of your paycheck to put it into the electrical bill. When getting a freezer, there are some basic things you should check on. The first is how big is it. What is its total height, width, depth on the outside, and how big of a ventilation space does it require? The biggest problems with buying freezers come when they don’t quite fit where they were intended. After that, there are other things to consider. What is the freezer capacity and how much of that is actually useable? Some freezers have a large space between the door and the shelves that house nothing but cold air, which drains electricity and helps cause freezer burn. Does it have a lid or a door How much space does the lid require? Is the door reversible, which way does it open, and what type of handle does it have? Those also factor into where you can put the freezer. Then there are factors like whether or not it is Energy Star Qualified, or other qualifications, and whether that matters to you. Does it have shelves, baskets, things like ice makers or security locks, interior lighting, power indicator lighting, and does it require manual defrosting or does it have an automatic option? Lastly, there are aesthetic aspects. What color is it? Does the door or lid and the rest of the machine match? What shape is the door? Does the door have a texture? 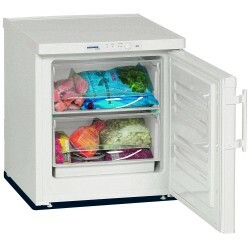 All of those different questions should go into purchasing the right mini freezer for your needs.